Rearrangements are large-scale mutations in genomes, responsible for complex changes and structural variations. Most rearrangements that modify the organization of a genome can be represented by the double cut and join (DCJ) operation. 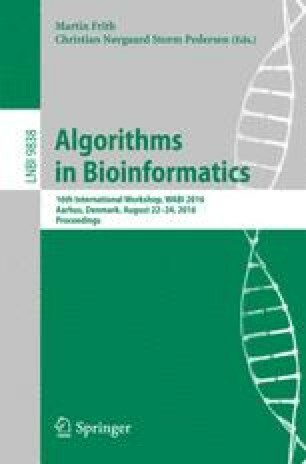 Given two genomes with the same content, so that we have exactly the same number of copies of each gene in each genome, we are interested in the problem of computing the rearrangement distance between them, i.e., finding the minimum number of DCJ operations that transform one genome into the other. We propose a linear time approximation algorithm with approximation factor O(k) for the DCJ distance problem, where k is the maximum number of duplicates of any gene in the input genomes. Our algorithm uses as an intermediate step an O(k)-approximation for the minimum common string partition problem, which is closely related to the DCJ distance problem. Experiments on simulated data sets show that the algorithm is very competitive both in efficiency and quality of the solutions.